Line an 8×3 inch springform pan with parchment paper that goes about 2 inches above the top edge of the pan. A springform pan is best so that you can easily remove the cake once it’s been assembled. 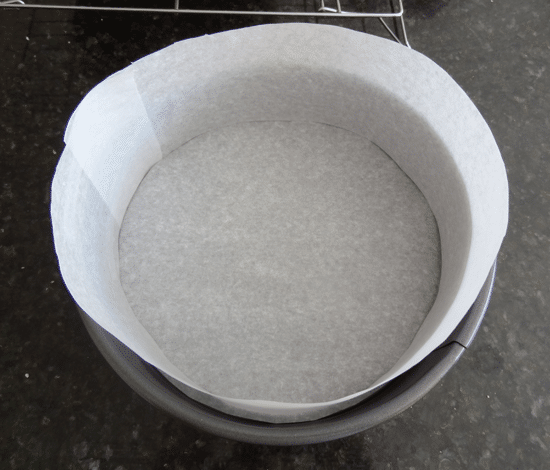 If you only have a regular 8×3 inch cake pan, line the cake pan with plastic wrap (which can later be used to lift your cake out of the pan once it’s assembled and frozen), then add the parchment paper. You can also place a cardboard cake circle in the bottom of the pan, on top of the clear wrap. To make the crust, combine the shortbread crumbs, sugar and melted butter. Press the crust into the bottom of the cake and form an even layer. Set the crust in the freezer to firm. Combine strawberry puree, water, sugar and cornstarch for the strawberry filling in a small bowl. Microwave in 10 second increments until thickened, about 30 seconds to a minute. Set aside to cool. Combine key lime juice, sugar and cornstarch for the key lime filling in a small bowl. Microwave in 10 second increments until thickened, about 30 seconds to a minute. Set aside to cool. Beat the cream cheese and sugar together until smooth. Add the milk and coconut extract and mix until well combined. Set aside. In another bowl, whip the heavy whipping cream and powdered sugar for the coconut ice cream until stiff peaks form. Gently fold about 1/3 of the whipped cream into the cream cheese mixture until combined, then fold in the remaining whipped cream. Add the coconut ice cream on top of the crust and spread into an even layer. Place cake back into the freezer. Beat the cream cheese and sugar together until smooth. Add the milk, strawberry extract and strawberry filling and mix until well combined. Set aside. In another bowl, whip the heavy whipping cream and powdered sugar for the strawberry ice cream until stiff peaks form. Gently fold about 1/3 of the whipped cream into the cream cheese mixture until combined, then fold in the remaining whipped cream. Fold in the pink food coloring. Add the strawberry ice cream on top of the coconut ice cream and spread into an even layer. Place cake back into the freezer. Beat the cream cheese and sugar together until smooth. Add the milk and key lime filling and mix until well combined. Set aside. In another bowl, whip the heavy whipping cream and powdered sugar for the key lime ice cream until stiff peaks form. Gently fold about 1/3 of the whipped cream into the cream cheese mixture until combined, then fold in the remaining whipped cream. Fold in the lime green food coloring. Add the key lime ice cream on top of the strawberry ice cream and spread into an even layer. Place cake back into the freezer until completely firm, 5-6 hours or overnight. Once firm, remove the cake from the pan. If needed, smooth the sides of the cake using a warm offset spatula, and place cake on a serving plate. Top the cake with whipped cream (you can use Cool Whip or make your own) and fresh strawberries and lime slices. Allow to sit out of the freezer for at least 30 minutes before cutting into it.